Our accommodation was only 5-10 minutes to China town when we stayed in Sydney. I think it might have been New Year’s day when we went to this Korean restaurant for brunch. The reason why we were looking for Korean food was that we eat a rice cake and dumpling soup on New Year’s day in Korea. Since I cannot cook one myself in hotel, we headed out to China town to find a restaurant that does it for us. 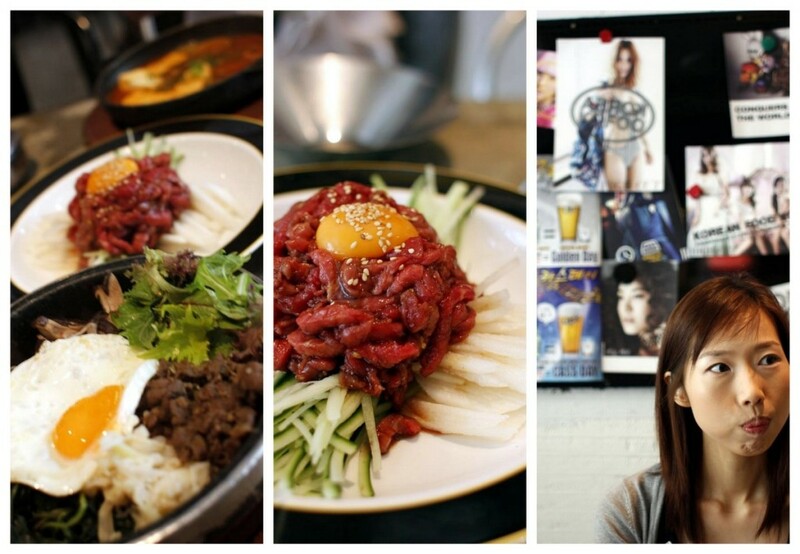 We found a cool looking one called ‘Kofoo’, which is shortened form of ‘Korean food’. I loved a modern pub style interior and friendly staff. Sitting there looking at Korean posters and listening to Korean songs made me feel I was in Korea for a bit. Sydney is definitely more multicultural city and you see so many tourists from all over the world on the streets. So I felt like I was in different country. By the time we got a table, it was almost 11am..11:30am.. Starving! Menu didn’t have a rice cake soup though other dishes sounded pretty good to us. We ended up ordering 4 dishes between two of us, thinking we were starving, first of all, and dishes would be small. We ordered dumplings for entree, bibimbap for me, soybean soup for Daniel and beef tartar to share. It turned out to be a lot more than we thought it would be, though we managed to finish all. It tasted more westernised Korean food than traditional as I expected. For business, yes – you need to make changes for the locals, though I have to admit it is quite disappointing to me every time I go to Korean restaurants here. Staff was pretty attentive and friendly overall. This restaurant apparently started in Brisbane as a little food stall, then opened up this restaurant in Sydney almost a year ago, and now expanding further to franchise business – good on them.